You love surprises. You love scarves. When you sign up for a Surprise Style subscription, each month our stylists will surprise you with one of the latest fashion scarves, sent right to your mailbox! ​It'll be waiting for you after a long day. Something just for you, just in time for a style fix. Will it be floral or paisley? Infinity or blanket? ​ You'll be surprised by style - and what could be more fun! ​If Surprise Style sounds like something you and your wardrobe need, sign-up for your surprise. Just choose how long you'd like to subscribe and let us do the rest! 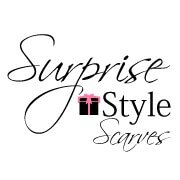 ​Sign up for your monthly surprise scarf today.